Most people spend their birthdays going out with friends or visiting family. Chris Wahmhoff had a different idea on how to spend his 35th birthday. Wanting to bring attention to corporations that need to be held responsible for their wrongdoings, Chris got on his skateboard and made his way into Enbridge’s 6B pipeline, south of Marshall, Michigan, where he was able to halt operations for 10 hours on June 24th, 2013. After a peaceful protest, Chris exited the pipe without force from the police and was arrested. As a result he faced felony charges, which were dropped as of January 13th, 2014. Not yet totally out of the clear, he still faces a misdemeanor charge for trespassing. That isn’t stopping him from taking things a little further and entering the 2014 race for the U.S. Senate. Like Chris, there are activists nationwide determined to make a change for better environmental regulations. 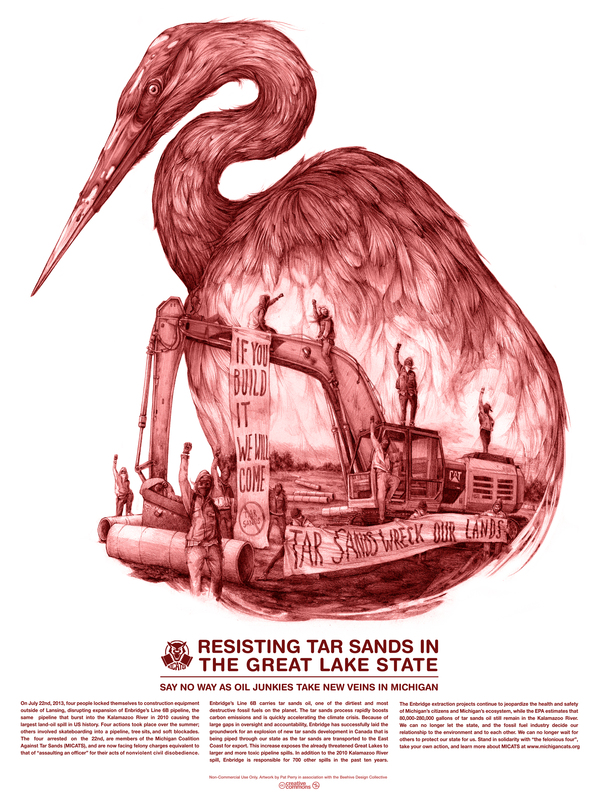 On July 22nd 2013, activists Vicci Hamlin, Lisa Leggio, Barbara Carter and Will Lawrence of the Michigan Coalition Against Tar Sands (MICATS), locked themselves to Enbridge’s equipment to halt construction of their tar sands pipeline 6B expansion. During this peaceful, non-violent protest, no equipment was damaged. The company alleges the activists put their workers in danger, but the activist arrived before work started, so when they locked themselves to heavy equipment, no workers had arrived to the work site yet. They now face felony charges for resisting arrest and have a trial set for January 27th 2014. Seven other activists from the same group were charged with attempted trespassing for being on property they believed to be public, due to no posted signs. Those seven are looking at a plea-bargained arrangement that provides they maintain good behavior for 3 months and it would be settled out of court. These activist maintain they are not criminals, just passionate people who care about creating a better planet. On January 15, 2014 the four non-violent activists charged with felonies for resisting arrest and their supporters made their way to the 55th District Ingham County Courthouse with a motion to quash. Judge William E. Colette denied the motion and made it clear he was not a fan of the publicity he felt this case was getting. In a statement he said, “I am tired of people coming in here seeking publicity for themselves”. The judge went on to criticize the defendants and their supporters for organizing court protests. The judge claims the activist held a protest before court that morning but the activist and their supporters say that is untrue – signs were brought out only after the motion was denied. In July of 2010, Enbridge’s pipeline 6B was responsible for spilling over 1 million gallons of tar sands oil into the Kalamazoo River, although Enbridge claims it was around 800,000. The diluent in the spilled oil vaporized, releasing benzene and other harmful chemicals into the air. This disaster is still far from cleaned up and continues to poison the community and its water supply. Much of the remaining tar sands oil sank to the bottom of the river making the cleanup process harder to accomplish. The estimated cost of cleanup was around $767 million as of July 2012, making it one of the costliest cleanups in US history. Early January 2014, the EPA released a statement saying they were “evaluating enforcement options” against Enbridge after the company failed to meet the December 31st 2013 deadline. According to the EPA, Enbridge has not yet completed all of the work required by the order. Companies should never put profit before people or the environment. Without people like these activist, that are willing to stand up and bring attention to it, it’s just going to get worse. If you would like to stand with the CATS or need a ride to the upcoming trial, become a friend on Facebook to connect with others. We must ensure the ones responsible for these environmental disasters are held accountable. On January 31st, 2014, after four days in court including nine hours of deliberations, Barbera Carter, Vicci Hamlin, and Lisa Leggio were found guilty on all charges and are currently awaiting sentencing on March 5th. The trial judge revoked the bonds if the three protestors once they were convicted, and remanded all three to the Mason County Jail. Sentences up to two years in prison are possible. Enbridge Co. is also seeking restitution for the cost of one days with of lost work, which they claim is about $45,000*. *Correction from the collective: In the Winter 2014 issue in which this article was originally published, Critical Moment initially reported that Enbridge Co. was seeking restitution of $70,000. This was later discovered to be incorrect. The below poster was drawn by Beehive Design Collective artist Pat Perry who released the work in the Creative Commons. It was used on the back cover of our Winter 2014 Issue.